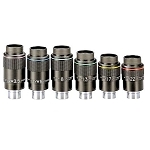 Like lures in a celestial tacklebox, eyepieces serve many purposes and one of the best all-around eyepiece designs for general purpose observations is the four element, two-group plossl. Inside each Vixen NPL is a matching set of doublet lenses - each convex and concave element of the finest glass obtainable for the price sandwiched together with optical perfection. From there, the Vixen Plossl is multi-coated to enhance contrast and reduce reflections and sealed into a brushed aluminum and chrome eronomic work of art. From clearly marked focals lengths right down to the added safety edge on the barrel, these plossls are a well thought out design. The large apparent field of view from the symmetrical design gives you an eyepiece that produces an edge-to-edge flat field of view with excellent color correction. 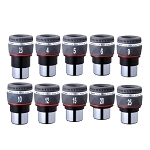 Vixen uses only well matched convex and concave lenses to prevent internal reflections, and the quality of the NPL stands head and shoulders above other competing plossl designs offered at a similiar price. 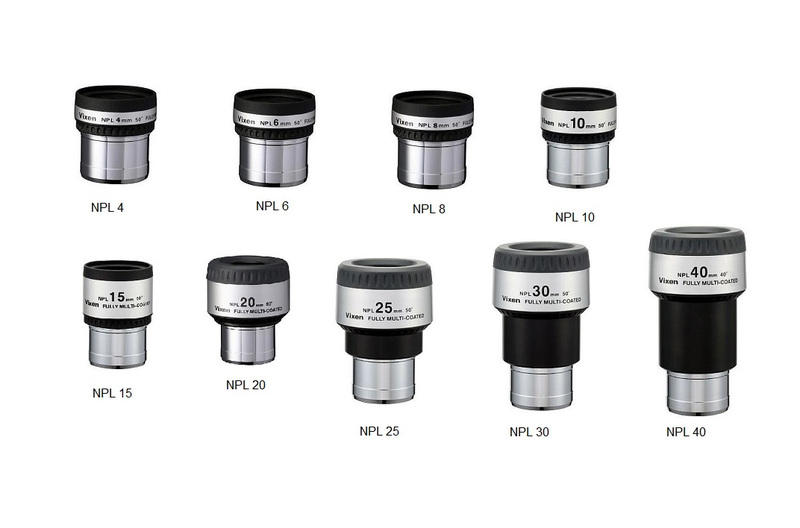 You'll soon come to value your Vixen Plossls as one of the most used eyepieces in your collection! Exceptional quality and value for general purpose use. Above average field of view yields crystal clear images. Shorter focal lengths are perfect for lunar and planetary work. Longer focal lengths provide outstanding deep sky views. Captive edge on barrel to prevent slipping from focuser. Quality manufacturing meant to withstand years of use. This model features a twist-up rubber eyecup for added viewing comfort!